Studio Ghibli movies are unlike any other movies I’ve ever experienced before. They evoke a different sense of feeling for me than watching really any other film, and it may be because Studio Ghibli specialized in anime films. Outside of this studio, I have not found any type of anime that is even comparable to it. Studio Ghibli movies go beyond the surface level topics and they create unique, memorable characters that enchant viewers right from the jump. 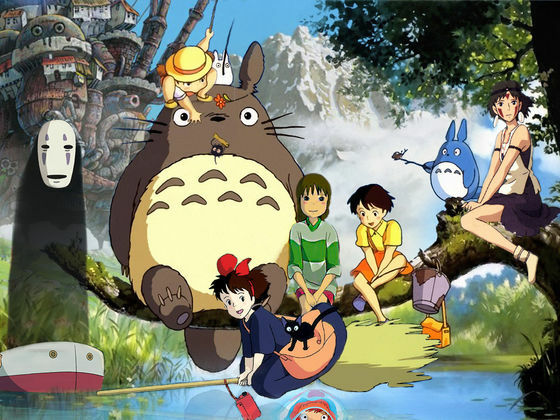 Studio Ghibli films mix fantasy and reality creating worlds that never before existed. If you haven’t experienced one of these films before, let me tell you why you should give them a try and which ones I recommend you start with. I have not seen every Studio Ghibli movie yet, but out of the good amount that I have seen, I have LOVED every single one. Not liked, instantly loved. That’s probably due in part that I have related to the films on a personal level. I’ve felt the emotions the characters felt and made myself believe that world could in fact exist, even though they are very loosely based on reality with characters I couldn’t even fathom being real. Out of the films that I have seen, these are my recommendations for films you need see if you’re looking for top-notch storytelling and gorgeous animation. This was my first Studio Ghibli film. It introduced me to anime and it still resonates with me today. Essentially, it is a coming-of-age story where Kiki, a new witch, discovers how to use her powers. I really enjoyed this film because it had a magical aspect to it, but Kiki also faced real-life problems that anyone could relate to. She challenged herself by moving to a new city, lost faith in herself, struggled with fitting in, and found romance. No good film is without an animal sidekick. Her black cat Jiji aids her on her adventures and, although is pretty skeptical about the decisions she makes, adds so much humor to the film. I saw this one as a child as well, and although this movie scared me a bit way back when there are so many things I appreciate about it. Studio Ghibli really excelled in making the spirit world Chichiro transported to realistic. It’s the details that make this movie come together and the characters (some terrifying) were memorable and intriguing. A word of caution to younger me: the bathhouse where Chichiro is forced to work gave me terrifying chills and really stuck with me. Now that I’m older, I can go back and appreciate the symbolism that I did not notice as a child. For me, this is the cutest film of them all and it is on the top of my list. How could you not like a big fluffy mixture of a cat, owl, and raccoon? Totoro was a perfect distraction as the main characters were going through a tough time. Although Totoro is silent during the film, his actions and his gigantic grin were enough to sell me on his amazingness. I think everyone could use a Totoro to help them escape life’s hardships. He is the perfect fantasy companion to make you feel safe, even when you are not living in reality. If you’re looking to see these films in theaters, Studio Ghibli is bringing them back for a limited time for Studio Ghibli Fest 2018! Be sure to check your local theater to see if these films are playing near you. They’re bringing back 9 of their feature films for select weekends so you can enjoy the experience on the big screen. Films include Ponyo, The Cat Returns, Porco Rosso, Pom Poko, Princess Mononoke, Grave of the Fireflies, My Neighbor Totoro, Spirited Away, and Castle in the Sky. The fest began in March and will run through November, so you still have plenty of time to catch some of Studio Ghibli’s best! If you have no luck there, stop by your local Bookmans and see what we have on hand. We always have Studio Ghibli films coming in and out, but they go pretty quickly!